Well…what a month. I hope you followed our advice and kept to your stop discipline which got us out of our tentative long position at 250 before the collapse down to 166. Since then we’ve kept out of the market to see what transpires. Looking at the chart you can see that the trend is still down, so we should be playing this market from the short side. But there’s something in the way the market is behaving that makes me more inclined to still trade this from the long side – but very cautiously. Our recommendation is to take a small 25% long position at the current level (226 as I write this) with a further 25% long at 220. Initial stops should be placed below 200. On the basis of how quickly this market can move we will also give a short break recommendation. 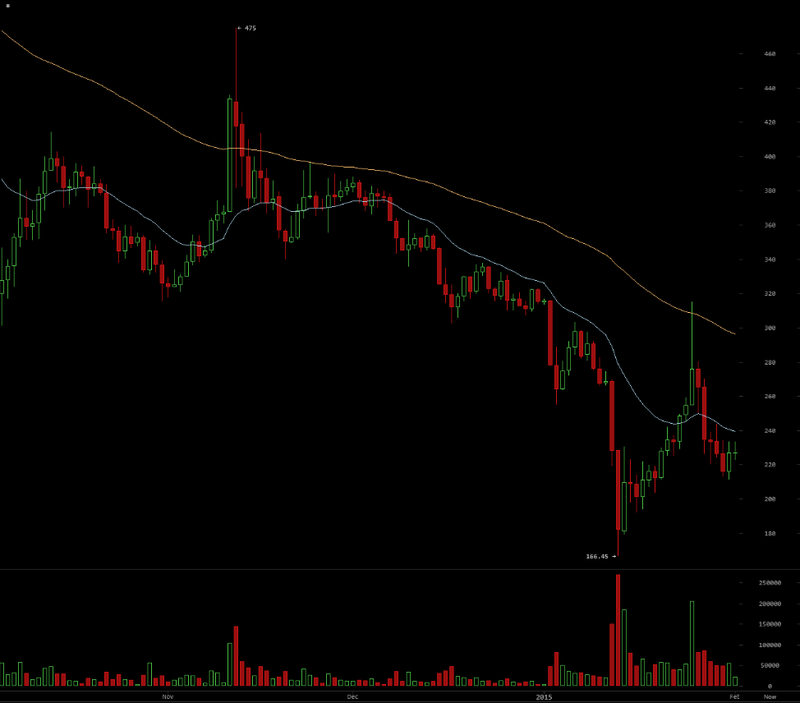 We will be looking to go short a full 100% of the way on a break below 160. We don’t believe this is the scenario that will unfold but if it does we can see a quick spike down a further $30 where we will look to cover our shorts (at the $130 level). Over the past few days market action is starting to look mildly constructive; It is encouraging enough to suggest that we dip our toes back into the market. We are entering to buy of a 25% position at the current price (284 at time of writing) with a further 25% bid below the market at 271. Protective stops should be placed below the 250 level. I would recommend a very disciplined use of Stops at the moment as a further slide can’t be ruled out. We will build on this position if the market starts to trade higher. Last week we announced our expectation that Bitcoin value was in decline. Those following our recommendation should now be short a small or 1/3 position, taken just below the $342 level. 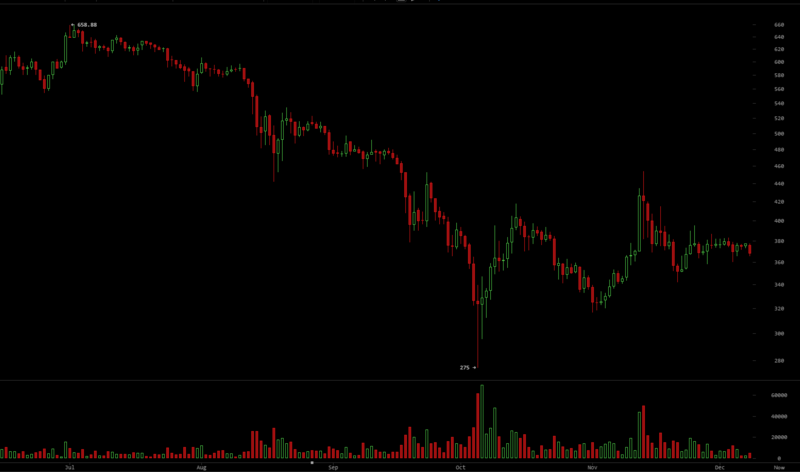 We do not anticipate the market holding at $310. 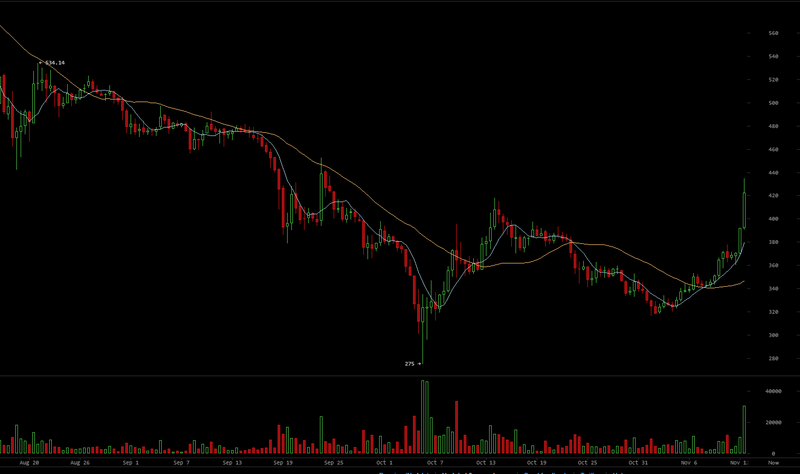 Rather we are expecting a push below $300 to retest the lows established in October. Do NOT add to this short position at these levels (the market is at $320 as we write this) as our central thesis is that this is still longer term base forming. Plan to cover the small short position at the $290 level if the market gets down to that point. On the upside, plan to cover the short position and go long a 50% position if the market breaks above $360; if this happens we expect the market to be wrong-footed and could a see significant number of traders covering their shorts. Unless this happens stay short and look to flatten out at $290 as described above. We’re starting to get a bit nervous about BTC market behaviour. We have just returned from an extended trip into Latin America where BTC are used in some places just as readily as cash. Here is our advice for the current state of the BTC market. We’re starting to get a little nervous about bitcoin market behaviour. Followers of our recommendations should now have sold out of their long positon, 1/3 at $425 showing almost $100 profit from the purchase level and the balance at $360 at a much smaller profit. The chart shows a failure of the market to break the 50% retracement level of the major leg down ($680 -> $275) on the recent rally up to $454. 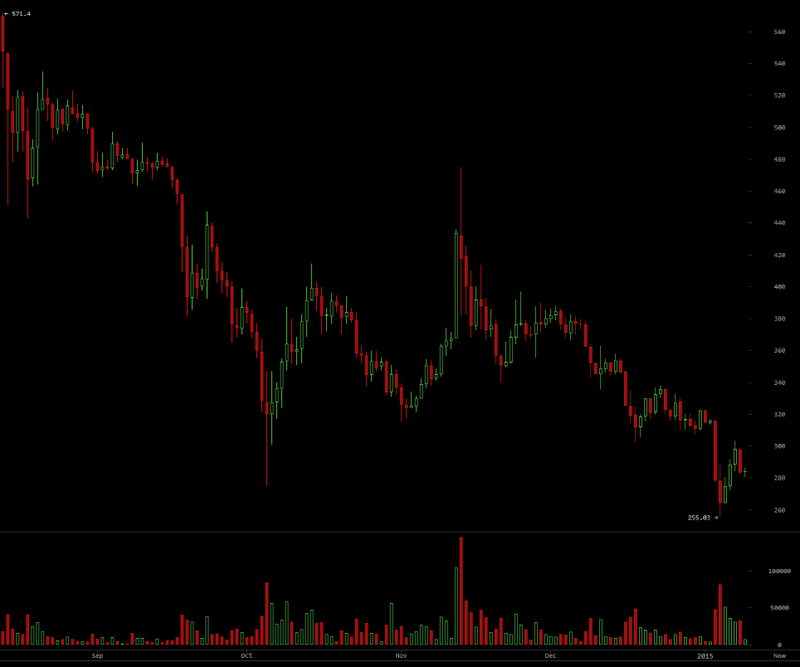 We have now drifted down on poor volume back to the $360-$370 level (with a low on the move of $342). While the declining volume on this move gives us some encouragement (the move seems more caused by lack of interest than genuine selling) we are concerned that the recent auction will create a ready pool of sellers looking to lock in some profits (assuming they were bought at a discount which seems likely). We will take a short position on a break below the recent low of $342, a break of this level is likely to be indicative of auction winners selling into the market. I would start with a 1/3 position and then see how the market develops, we wouldn’t be surprised to see the market retest the lows below $300 if the $342 level is broken. On the upside we are now in wait and see mode, we see nothing constructive in the price action to lead us to take a long position at this time. Regular readers who followed our advice should now have established a full position at an average price of about $333 (levels of $340, $333, and $325). The rapid rise on Nov. 12 to $430 is too good to resist so we recommend taking off 1/3 of the position at current levels ($425). 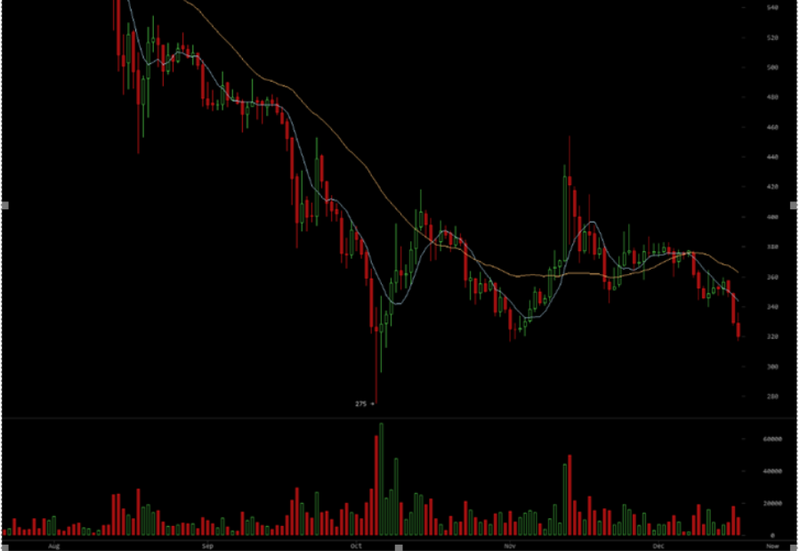 We would hold the remaining 2/3 position looking for a move up to $530 where we would sell the remainder. On the downside we would look to stop out of the remaining 2/3 position if we decline back below $360, if we reverse this high volume spike upward then we would probably retest the October lows – at the moment we believe this is a highly unlikely scenario. Don’t be spooked by the recent decline in BTC back to $350, this is natural market behaviour after the sharp snap-back and has been characterised by particularly low volume, a positive sign that much of the selling has dried up. After the initial pop we were looking to go long BTC vs USD at $320-$330, this level now looks optimistic. Scaled buying at the levels $340 /$333 / $325 should allow a position to be established at a good level with limited risk. We would still steer clear of paying up for this market as this first recovery leg is likely to be hesitant before the market regains its poise and confidence. Aggressive pyramiding can wait for the next up leg if we are able to establish a good base position at the above levels. Stops on these positions would be well placed below the lows reached in early October.